The first and most important preservation advise I can give is to document your finds. True documentation is very rare (faked documentation is fairly common). So many are found by those using metal detectors that never record where they found them and they end up sold to the highest bidder. If there is some provenance/history known by the previous owner then please record that as detailed as possible so at least that information follows the artifact along with your contact info. It should include the name of the finder, place, the date, etc. Any previous owners should also be recorded. In documentation there are gradients of strength. The more documentation provided with contact information, the more believable, the more value it has. This way the history can potentially be backtracked and verified. Why? The reason why will be obvious after reading the paragraph at the bottom about fake documentation such as the faked Skene Foundry tomahawks. Anyone can write anything on a blank piece of paper with a signature but that doesn't make it true. Being able to verify it independently can. Naturally provenance/history can & is faked frequently also so it must all be viewed with skepticism. Once you have some documentation the work to verify it begins- not ends. It is actually very rare to have true documentation of any artifact for many reasons. There are always opportunists who will make up, repeat or embellish stories they have no evidence for. I have often seen the word documentation used referring to the auction description that came with it. That is not really documentation. It may be true but we don't know. If someone writes on a piece of paper "This tomahawk is genuine" that is not really telling us anything. True documentation that shows a trail of evidence & provenance tracing back to the period is actually extremely rare. Many finders guard their privacy by not signing or documenting anything, or providing a different location, which is a loss to us all. Sometimes people ask me to authenticate an artifact by first telling me the story that came from the seller. Frankly that is totally irrelevant to me until the physical object is authenticated --or not. IF the artifact is authentic and matches the story & further research verifies the story, then and only then, can it add to its historical value. Like layers of an onion peeled back one at a time, there can be many layers to documentation & levels of trust in it. Anything that can be documented by the previous owner with their contact information allows for the current owner to contact them in order to attempt to further substantiate their claim, gather more evidence & also provides a legal trail of evidence. Let the next owner decide whether that particular provenance has merit or not. Otherwise, true or not, it is lost forever. This is just part of preserving your collection and preserving their history. Another important reason to document your finds is to hopefully show evidence of where it was NOT found--such as on U.S. federal land or other protected properties. The laws are very harsh & can result in a lifetime collection being confiscated along with serious felony jail time & many thousands of dollars in fines. The FBI is very actively pursuing these cases &, as odd as it sounds, the burden of proof seems largely to be on you, not them. The NAGPRA act took affect November 16, 1990. The Native American Graves Protection and Repatriation Act is a law that establishes the ownership of cultural items excavated or discovered on federal or tribal land after November 16, 1990. This is particularly important in Western U.S. finds due to there being so much Federally protected land there. http://graphics.latimes.com/utah-sting/ This is the amazing story of the 2009 arrests made of some 24 collectors/dealers in the 4 corners area of Southwest. It is something every collector & federal investigator should read. Three of them committed suicide including the informant. Also the legalities in Canada vary from province to province and the interpretation of all of these laws is often very subjective in both countries. For example Manitoba has taken a legal stance now that anything found on or in the ground after about 1890s belongs to the Manitoba government & by international treaty those artifacts are subject to be confiscated & returned from other treaty bound countries. However what results from it are sellers changing the location of the find or not divulging it at all. So the result is that history they were trying to save is permanently lost to all of us. This is a very good article called "Trade in Native American Antiques Can Be Tricky"
"There's no clear definition of what's legal and not legal," Gallegos said. "NAGPRA talks about objects of cultural patrimony and sacred objects, but that becomes very subjective. Who makes that determination? When there are issues with a particular item, the federal agents tasked with enforcing the law will often ask the Native Americans what is sacred and what is not sacred. Well, if you ask a Native American what's sacred, he has to say almost everything is because that's their whole world view." They go on to say "ATADA does not regard items made for commercial or individual use by Native American artisans as sacred or communal, regardless of age. The age of an item does not determine its religious significance." Another legality issue is when documentation is shown to be faked--and it often is. In that case there may be a written trail of evidence back to that seller that holds them legally liable for damages both punitive & actual. Here is a bizarre Federal law that conflicts with education of the public on Indian artifacts & has plagued my tomahawk research. It called the Archaeological Resources Protection Act of 1979 which in Sec 9 makes it illegal to share with the public any permitted site artifact locations or the 'nature' of discovered artifacts, including photographs of them (by some interpretations). ​ It states "Information concerning the nature and location of any archaeological resource for which the excavation or removal requires a permit or other permission under this Act or under any other provision of Federal law may not be made available to the public..."
While the law is meant to protect the sites from amateur collectors it also prevents education of the public which likely paid for it! I've read another person's recollection of talking with Chandler who in the early 1900's had been collecting sacred medicine bags from the Winnebagos and then literally chased out by some angry warriors. You might recall Chandler wrote the blacksmithing Appendix in Peterson's American Indian Tomahawks book. There are many things considered sacred by tribes--perhaps more than is not. While one Indian might sell an artifact to you another might demand it back because it is sacred. That is sort of the yin & yang of the traditionalists versus the non-traditionalists. Just as whites, they do not all believe the same things. U.S. Federal law sides with the traditionalists in that, generally speaking, anything they deem sacred is protected to some extent. There is more to it of course & it is not well understood even by the people who enforce it since defining something as sacred is hard to put in legal language because even the dirt under their feet might be identified by Indians to be sacred. There are 2 primary rules in regards to the oxidation/rusting away of iron and other metals. 1) Everything will oxidize & degrade to dust eventually given enough time. 2) There is nothing anyone can do to change rule #1 --except slow it down. It may take a few thousand or a few million years years to disintegrate, or a few years if it is already beyond salvage. It all depends on it's initial condition when you acquired it and how it is treated afterwards. In most cases it is not necessary to take it down completely & certainly not desirable, however in some cases there is no other choice. When in doubt do less rather than more to it. Once something is removed it cannot be replaced. You want to remove the active rust --the red rust which is actively/currently converting it to rust dust. 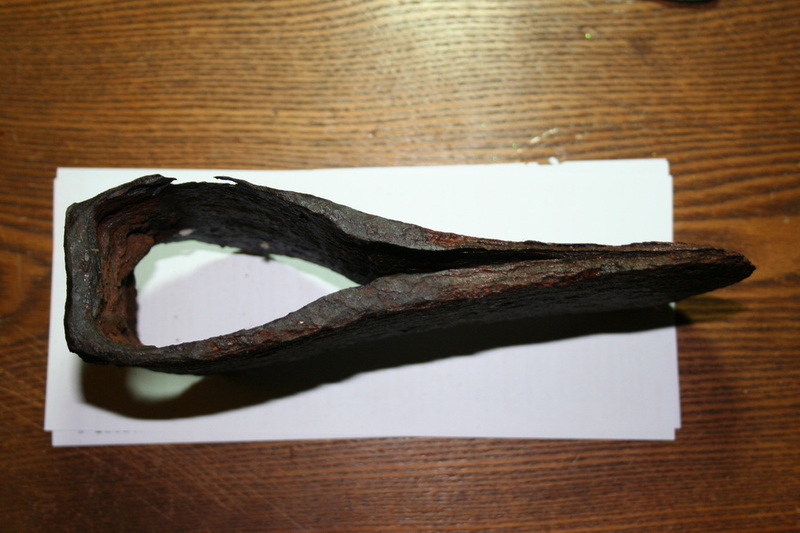 The dark coating seen on old metal that has been stored inside for years is a much more stable form of iron oxide & iron molecule combined that actually forms a barrier to further active rust occurring. Leave that alone, please! Once that dark barrier is removed fresh rust can take hold much easier. I have seen ones that were cleaned to bare metal that allowed flash rust to occur literally overnight. Next keep it in a relatively low moisture environment in the 35-65% range for as many thousands of years as you can. You can put that in your Last Will & Testament but good luck. With iron or steel objects the dryer --the better, however for wooden, leather or other fragile objects it is better somewhere in the middle range to keep it from cracking from drying out too much. If the iron is already flaking off rust then I prefer to cautiously tap the solid portions of the iron with a hammer until the flakes of rust are knocked off with the vibrations. If the iron is so soft that it cannot be tapped without breaking then it is unfortunately already too far gone to salvage. This kind of advanced degradation usually means electrolysis will also be necessary after the vibration/tapping is done. (See photos below for example). Just google 'iron electrolysis' and you will find several good methods of doing so described. Today iron and steel are very specifically made knowing the exact quantities of each of the elements produced in making them, but in those days making iron & steel was more of an art than a science -- irregularities & impurities occurred frequently. This often served inadvertently to preserve the iron affecting the rate of corrosion, such as phosphorus which was bad for the strength but good for preservation. What chemicals are in the ground can also affect the rate of corrosion such as Ca+, hydroxides, acids & many others. Some slow it down-- some speed it up. Wrought iron is very resistant to corrosion because of some of these flaws, by modern standards, in metallurgy such as silicon & slag inclusions that cause that striated stringy look so it is often found centuries or even millennia later such as Roman iron axes. Steel is different than iron having more carbon in it than wrought iron. When we say more or less carbon we are generally speaking of a 1% difference or less. A very tiny amount makes a very significant affect. Corrosion rates vary from steel to wrought iron so often the steeled edge for welded on edges can be readily discerned from this difference. It amazes me they are even still around at all. If I was trying to preserve a thin unmarked knife blade that was actively rusting I would use electrolysis since it has far less metal remaining & unprotected. If it is marked and you want to save the mark then its a judgment call. You could use electrolysis again but then you risk losing the mark which is part of its history so it is best to use more conservative treatments first. I do not recommend the black primer rust preventative sprays and coatings used to treat rust on cars. They will protect the metal but will make the metal black & also lower its value/appearance significantly. Worst it hides the true appearance of the patina. When patina is the only thing that can separate originals from fakes it is extremely important to preserve that patina. Metal, rust & pitting can all be reproduced artificially-- covering up the details makes it difficult at best to determine if it was tampered with. Collectors much prefer a natural looking patina. Recently I was at a show where the whole table full of dug fur trade artifacts were coated in this black primer but nobody wanted to buy them. I've had luck with removing some with paint remover and a wire brush but that isn't something good for maintaining its natural look either. There are better ways to protect it. All rust starts from the outside surface and works toward the inside because it has to react with oxygen to form iron oxide. That means if you don't see active rust on the surface you will not find it hidden below the surface. Now that doesn't mean it couldn't work into a fissure where a folded axe blade crevise is but that is still exposed to the outside. You can see that. I try to pick those areas carefully with a dental pick to be sure the reddish rust is removed there, rinse it out, dry it thoroughly & then coat it with Boeshield T-9 or microcrystalline conservator's wax or whatever you choose. My personal favorite has been the Boeshield T-9 oil since it also contains waxes which preserve the coating longer, prevent rust & give the metal a good natural appearance. It is used on jets and airplanes and was developed by that industry. The spray gets into the crevices easier. All these coatings are doing is displacing the outside moisture from the surface of the object. But remember that it must be "reversable". What I mean by reversable is it can easily be removed in the future while at the same time not damaging the artifact. This is a cardinal rule in museum preservation work. I don't recommend rust converter or other more permanent coatings for that very reason. Many things affect the rate of the oxidation of iron or steel such as the pH, moisture content of the soil, whether it is in contact with other natural metals or minerals, presence of salts, and porosity of the object's surface, amount of oxygen available, etc. There are so many variables. Take the conservative approach first. Once it is removed you can not put it back. Antique dealers never clean their objects unless they want to lose money because it is removing clear evidence of it's age & history. Chemically speaking aging is an oxidation process where the artifact materials react with oxygen & water along with other elements to break it down from the outside in. The corrosion of metals is an electrochemical process. That is, it is an electrical circuit where the exchange of electrons (electricity) is conducted by chemical reactions in part of the circuit. These chemical reactions occur at the surface of the metal exposed to the electrolyte. Oxidation reactions (corrosion) occur at the surface of the anode and reduction reactions occur at the surface of the cathode.The rate at which it degrades varies with the degree of exposure, length of time of exposure, type of exposure (electrolytes like salts and calcium ions & acids) and the availability of oxygen. All these variables do affect the appearance of the rust/patina. Much of the wrought iron in this period contained more phosphorus which combined with iron to form a protective coating preserving it longer than steel today. Refining techniques back then were not nearly as good as today so the phosphorus was usually not removed. Also the silicon slag (like a form of fiberglass) helped preserve it longer since it also does not degrade as fast as the more pure, yet stronger, forms of today. This British Rev. 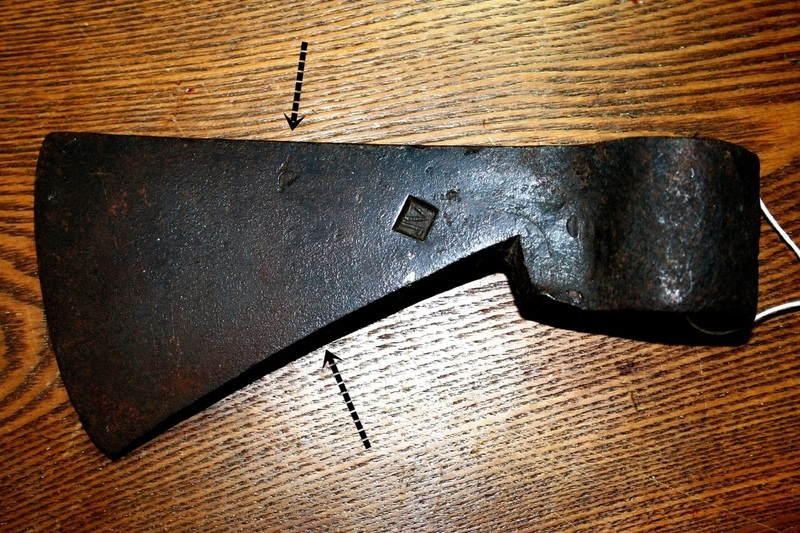 war axe was recently dug & was cleaned only by tapping a hammer to the iron. The vibrations cause the rust to fall off & leave only stable iron/steel. It was then treated with Boeshield T-9 Oil & has been stable ever since. Notice the reddish rust (most active) is what is removed. For many dug axes this is all that is needed or desired. Preserving wood such as hafts, war clubs, etc should be done by controlling the environmental humidity between 55-70%. Nothing else should be done to it. No oiling, no waxes, no nothing. Leave it alone, it will be fine. I always tell my customers you can shine the hell out of it all you want but don't expect to get anything for it afterwards. By altering it you are removing/altering patina that proves its authenticity. Removing it is removing it's history. I know some prefer to clear coat their iron trade items but I do not recommend it. It is not necessary & harmful to detecting the true patina. While it does form somewhat of a barrier to moisture it can also seal in moisture that is already present. It also detracts from its appearance to the eye of some. NEVER use Polyurethane or Varnish. Varnish is much more difficult to remove than lacquer, if at all & polyurethane is virtually impossible to remove from pitted surfaces. Some museums and National Parks use this technique but they are not worried about fakes or it's resale value. They should worry about it since they receive many of their items through donations. The trade axe below I've owned for about 20 years and have done nothing to it except rub it with some Briwax a couple of times. This axe has been handed down from one collection to another for some 80 years and has not essentially changed it's appearance. The black iron oxide coating forms a protective barrier against the unstable active reddish iron oxide you want to avoid. You'll notice there a some tiny pin point specks of red toward the blade edge which I have not done a thing to and have not grown in size since I have owned it. Also the reddish specks end about half way up the blade indicating where the 'steeled' portion is! Had I cleaned this to bare metal that evidence would have been removed & its value diminished to next to nothing. Right now it is very stable and will not rust significantly beneath the surface as long as the storage environment is dry. Collectors have a responsibility to preserve not only the artifact but also it's history. Recently a friend of mine bought an extremely rare Indian trade knife from an estate out West. Unfortunately that was all the information that came with it. When the seller was asked for more history about it he gladly cooperated but a few days later returned to say the owner had just died the day before in the rest home when he went to visit him. So if there was a history concerning that knife it died with him. This is the sad reality many of us collectors experience daily & perpetuate by our own failure to catalog that history and attach it to the item. Metal detecting for Indian artifacts has grown tremendously in the last couple of decades, but very few of those hunters actually document their finds. We depend on our memories and our ability to one day tell the next person who inherits it what we know. Things happen, people get sick, items scattered at estate sales. Usually it never happens, memories fail or are incomplete & nothing in writing then exists. This lack of attention to the history also works against the detector guys because archaeologists treat them as looters. We can't claim to be preserving artifacts if we don't preserve it's history. It increases it's monetary value also. This needs to be something encouraged by the metal detector hunters as a whole. Unfortunately many of them simply are out for the quick buck fearful of others knowing where they were found or don't want others to know they were digging illegally. I know many collectors will pass up buying dug artifacts without any history to come with it. They don't even know if it came from a legal site & can be arrested if that turns out to be the case. If it came from a federally protected site its a very serious felony even if you only purchased it. Some people keep a written record book/catalog of their items with corresponding collection numbers painted on the items. The trouble with that is when someone dies that information never gets to the subsequent collectors and all they have are items with meaningless collection numbers on them. I can't tell you how many items I have seen over the years like this. Attach the history to the object so it goes wherever the artifact goes. Riker display boxes are cheap & a way to store the documentation/history with the item. Sometimes I will put the documentation in a clear plastic ziplock & tape it to the bottom of the riker box it is displayed in or better yet put it inside the box. Clear custom's form envelopes used in shipping make ideal ways of doing this on the bottom of the box since they adhere better than tape. Another way is to write/type the history on a permanent tag directly attached to the item. Or you can use small manila envelopes found in shipping supplies in retail stores that can hold more information and strung to the item. This way the history always follows the artifact. I had a friend tell me he has videos of when & where he dug his items as documentation but as I pointed out the auctioneer's are never going to be playing videotapes or reading catalogs at the auction. They don't have the time or inclination. Attaching evidence directly to the item is the only viable option. I know some people don't like the visual of tags hanging off artifacts on display but the alternative is that history WILL BE LOST if you don't. Don't fool yourself-- It will happen. Get over the visual distraction. Tell those looking at it that its history is preserved for the next generation. Serious collectors will appreciate that. Of course provenance can be faked too. I know of several dealers who routinely have made up their own fake documentation for nearly all the items they sell. (See bottom of page). Anyone can make up a good story but unless there is a trail of evidence to prove it, forget it. A piece of paper is signed--great, but how do you know they signed it & not the seller? Assume nothing because those who make a living making it up are hoping you do! Its also amazing how many people think they have purchased items from Custer's Little Big Horn battle or other famous sites on ebay! Those with little more than a story may be interesting but certainly not verifiable. Verbal history is never as valuable as written history and ONLY if it includes contact information (ways to verify the story). If so people can be contacted and histories can be investigated further. This is how the professionals do it. The con-artists just make it up. By including contact information of the original owner with that story, maps, signed material, it upgrades that importance considerably. Naturally the artifact needs to be authentic to begin with. With a name & phone number the original owner/finder may be contacted to corroborate the story--or not. On one occasion I encountered an eBay dealer who regularly made up letters of documentation with his items. His story didn't sound quite right as did his artifakes. When I tried to verify his story I discovered the person who supposedly signed it on that date had been dead for 10 years. Without contact info. to corroborate it its just a good story. Most Indian artifact collectors love history but seem oddly resistant to preserving this history in any realistic way. Once a history has been lost it is lost forever to everyone. We all need to proactively encourage our fellow collectors & ourselves to be responsible collectors of history rather than looters of it. #1) Make sure it is an authentic artifact before considering ANY history that came with it. Histories can be & are faked too. #2) Write down the artifact's history & physically attach it to the item (please don't glue it on). I prefer printing it on the computer and laminating it on a brown shipping tag that is physically tied to the object. I've only once encountered a journal record copy included with an item for sale. Not that I discourage journal records also but don't depend solely on them because they will always be separated from each item. #3) Include any contact information relative to the artifact, ie name, address, phone, emails, etc. --anything that can be backtracked to help verify the story is true. Avoid the use of the ambiguous word "found" since it may mean purchased there or dug there & the difference is important. #4) Include any maps, photos, emails (with headers), letters or other relative info. 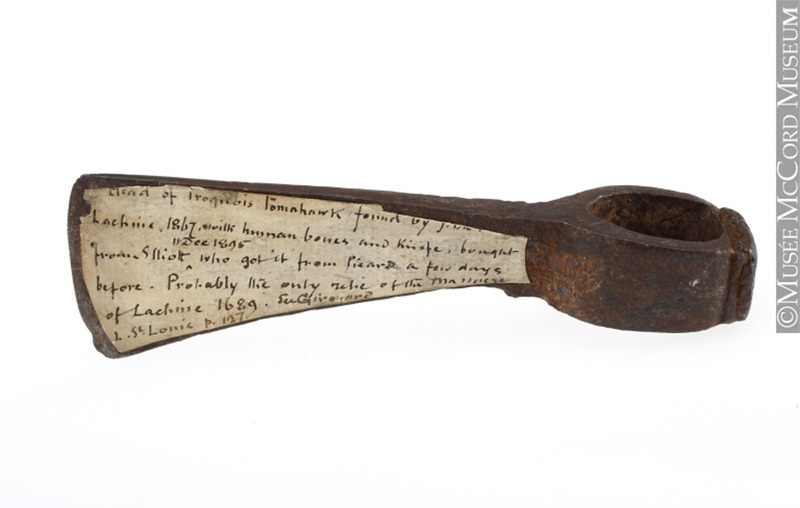 #5) Have the finder /original owner sign a letter of provenance if possible. Provenance is its history of ownership as far back as possible. Naturally people can make that up so that is why the signed letter helps & leaves a legal trail of evidence. #6) Make sure all the documentation goes directly with the artifact rather than kept in a book that is always disregarded by estate auctioneers. The more levels of documentation that can be added, the more it increases it's value--both monetary and historical. It can be 30 pages long ( & a few are), but if it has no way of corroborating any of it its basically worthless. With this data the original finder can be contacted & verify the the story. The postage shows where it came from & to who. The map further verifies the story. 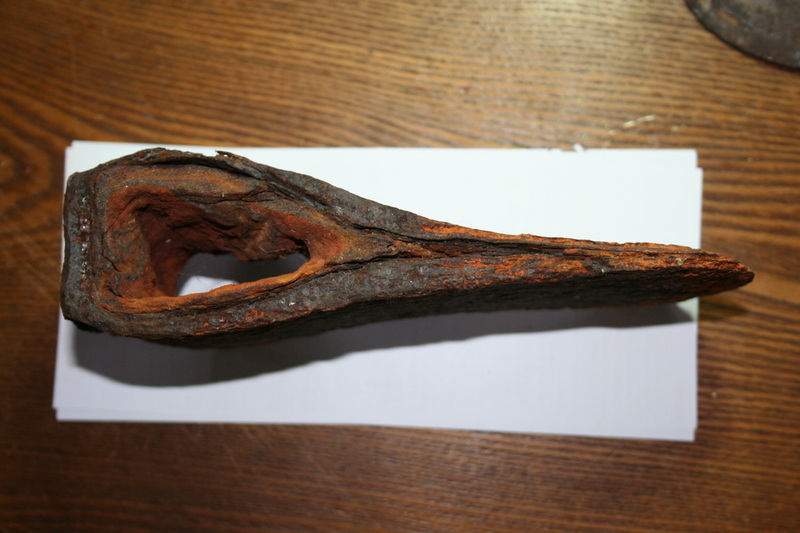 This mid 18th C. pipe tomahawk head with the bowl broken off (the pedestal indicates mid 18th C.) is an example of what to do and what not to do when writing documentation. The reference to having been dug from a grave in 1867 was appropriate to document, albeit 2nd hand info. and disturbing as a practice. The later lines speculating it was from 1689 was not accurate since pipe tomahawks were not invented until the mid 1740's +. (Gluing the documentation to the blade was obviously also a bad idea as it hides the artifact's surface.) The end result was the McCord Museum identified it as c. 1689 based on that speculation and the public that sees that item will generally believe that information to be accurate. This is the problem with documentation. I see this kind of mistake frequently with museum collections & private ones. Most museum curators have neither the time or expertise to accurately describe all types of Indian artifacts. They are often completely unfamiliar with fakes. Take it all in with a grain of salt and a lot of research before believing it. Critical thinking helps. When there is a signed letter of documentation ask yourself, do you know what the signature should look like? Do you know the history of the person who signed it? Did you research when they were born, died, where they lived, etc.? Do you know how it was collected & by whom & contact them? Do you know whether the object is what it claims to be despite the documentation? These & others are basic things all serious collectors know & do. 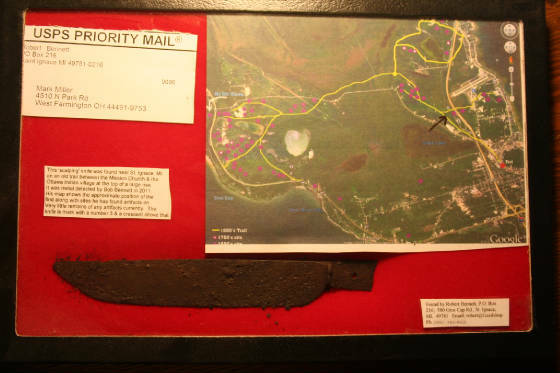 There are lots of 'Custer battlefield' artifact claims but extremely few that are authentic with true documentation. It is rare to have this kind of documentation which is why it can be so valuable if verifiable. Anytime you see a seller with mostly documented artifacts it should be a huge red flag something is wrong. Please beware of any Skene Foundry, Ticonderoga, pirate treasure or Maurice Foundry tomahawks, cannon balls, spears, pikes, bayonets, etc. There is a seller from Gore, Virginia who for 12-15 years has written his own 'documentation' with elaborate stories on these designed to arouse your love of history, signs it himself as the grand daughter of James Dunn in 1937....or some other person whom they know you won't likely follow up on, to faked modern repro items artificially 'aged' or old ones recently imported from Eastern Europe, Middle East, etc. as Revolutionary War or Indian tomahawks. (There is an example shown on this page about half way down. Upon looking up census data for Ticonderoga, NY. during the period for this James Dunn & his 'museum' you will discover there was no such person (or grand daughter) living there in the 1920s, 30's or 40's, etc. http://www.furtradetomahawks.com/more-fakes-mistakes-and-reproductions--2.html No doubt the story will change as time progresses. [update: after reading this the seller has changed the stories to Jamestown, Alamo, Continental Navy, Fort Sumter, Pirate Treasure...its amazing what people will believe.] Foundries never made tomahawks. Blacksmiths did. Often even his cannon balls aren't even cannon balls, they are steel mill balls for breaking down mined ore rock, yet they sell like cord wood-- all from famous battles --naturally. http://www.civilwardealers.com/fakes/ If it was sold as owned by George Washington there will always be some to believe they can buy if for $189 on ebay. It only takes one sucker to fall for it & they KNOW it. Interestingly most of his buyers now are other re-sellers passing along the same phony story with it. Stories are just stories if they can't be corroborated. Documentation that cannot be verified is virtually worthless. Stories are just that, even when written down--& most especially when the story does not fit the object. 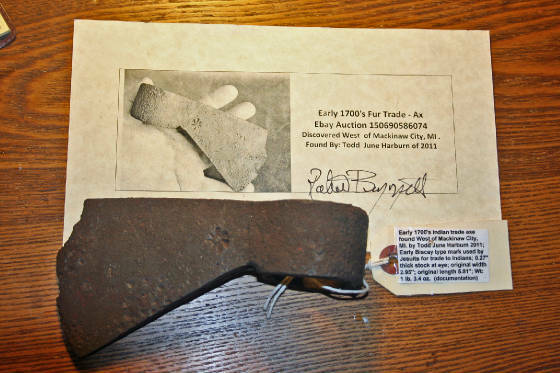 Lets say you bought an arrowhead from Custer's battlefield on ebay...so you write it down. Is it then true? Know what you collect or some psychopath will gleefully steal your money laughing all the way to the bank. They make their living doing it & have no empathy, no conscious. An artifact being shown published in a book is also not documentation of its authenticity. It documents it exists by the person who is making money publishing the book, but not WHAT it is or how OLD it is without specific sources. If supporting evidence is supplied which can be verified THEN & only then would it be of value as documentation. *"Collector's Ilustrated Encyclopedia of the American Revolution" by George Neuman and Frank Kravic "Preserving Your Collection". "American Indian Artifacts; How to Identify, Evaluate & Care for Your Collection" by Ellen Woods, 1997. "Fighting Iron; A Metals Handbook for Arms Collectors" by Art Gogan, 1999. "The Elements of Archeological Conservation" by J. M. Cronyn, 1999. "Wrought Iron; Its Manufacture Characteristics and Applications" by James Aston and Edward Story, 1952. "The Care of Antiques and Historical Collections" by A. Bruce MacLeish, 1998.